Is Paleo Here to Stay? Last week, I got something I’d been anticipating for a while: my first “paleo” spam. This wasn’t an email from a well-meaning, verifiable source in the established paleo community trying to sell me something. It was true spam—an email from an unidentifiable source with some generic copy about paleo-something-or-other, trying to get me to click on one of its links and take me heck knows where. It got me thinking about where we are in the lifecycle/track of this whole paleo trend. Basic trend analysis categorizes a trend according to its audience, starting with innovators, then early adopters, late adopters, and late majority (and sometimes laggards, if you’re feeling crotchety). 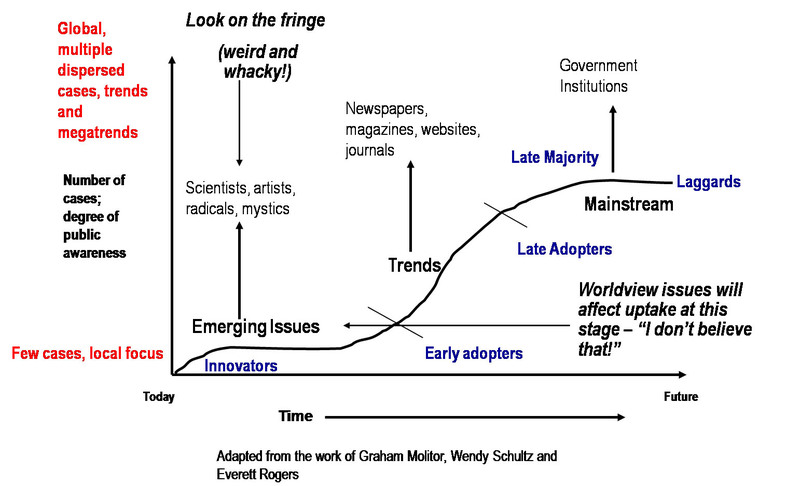 Right now, I’d put paleo at the tail end of the “late adopter” and start of the “late majority” phase. Even if you think they’re close (I don’t), government institutions definitely aren’t on board with this one yet, kids. Now, when I say “trend,” I mean that primarily in a value-neutral, not a pejorative way (but the spam, I will pejorate the crap out of the spam). To any sane observer, paleo is clearly a trend. A trend with a multi-year lifespan, and one with close ties to a number of other cultural threads and shifts, toward things like alternative and “natural” approaches to movement and exercise, local and decentralized food production and distribution, slow living, and a greater focus on family and community. Which I think most of us would agree are all Pretty Good Things. But even the most ardent paleo devotee also has to admit that the “movement” has been increasingly co-opted for its marketing potential. We’re starting to see “paleo-friendly” on product labels in the same way we’ve seen “vegan” and “gluten-free” for a little while already. Some of the really fancy stuff even comes with a “keto” label now. “Low-FODMAP” isn’t far behind. I like to also think of what’s going on with paleo as an ocean wave. The core of the paleo trend—the ties to science, to deep and wide-ranging lifestyle changes, and to the general thrust of the zeitgeist—is the wave itself: large, powerful, carrying all manner of sediments and biologia. It’s strong, and it can last a while. The wave also carries some froth with it. Salty bubbles, along for the ride. You can guess what the froth represents. *But back to my original question*: Is paleo here to stay? I think so. The more meaningful lifestyle and social/cultural aspects of paleo still have roots to grow. And in terms of dietary marketing, paleo will become as established and omnipresent as vegetarian or vegan. Again, I’m trying to be as value-neutral as I can here. This is simply what I think will happen. Not what I want to happen, or how I’ll feel about what I think will happen. In any case, my junk mailbox is probably going to keep seeing more and more paleo spam. Speaking of, somebody’s gotta be working on a paleo substitute for actual SPAM. I would eat that (maybe). Next Post Clean Eating, or, What’s in a Couple Words?